Since his graduation from the Hanoi Fine Arts institute in 1993, Trinh Quoc Chien has been developing a unique style to express his own perspective of Oriental Abstractionism. 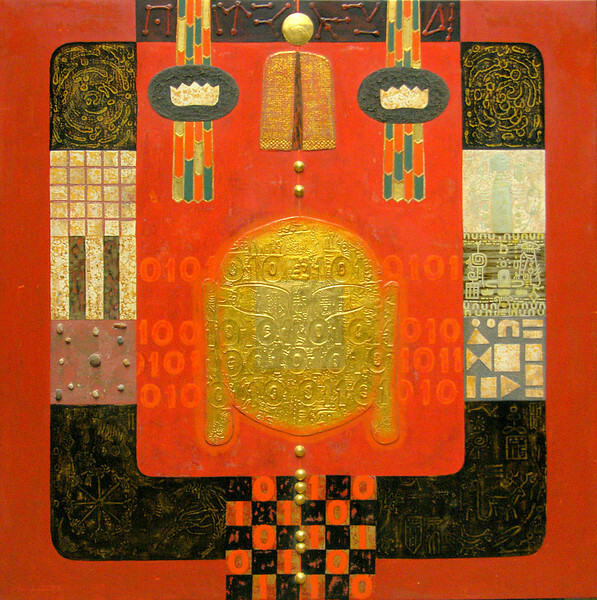 His complex creations represent meditations on a theme, broken down into a series of iconographic panels. The eye inevitably travels around the piece, from panel to panel, decoding the images before taking in the balanced whole. Chien takes the traditional Vietnamese art form of lacquer painting in a radically new direction by utilizing a variety of elemental substances such as silver and gold leaf, stone and pebbles. These materials are formed into cultural symbols, such as the bell and the lotus flower, or into traditional or invented iconography, to form highly structured, balanced representations of the inner life of the Asian psyche.